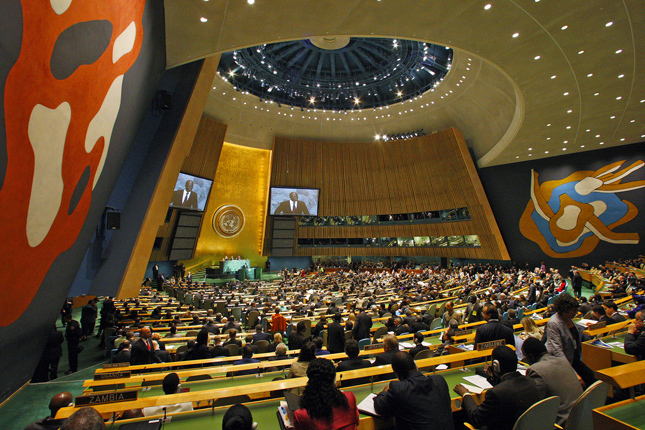 This year, the UN’s 193 member nations convened at a critical juncture as policymakers simultaneously reflect on the successes and shortcomings of the Millennium Development Goals, now in their final year, and move full steam towards finalizing their replacements, the Sustainable Development Goals. On September 29, as the General Assembly drew to a close, Maricle, alongside a panel of experts, gathered at the Wilson Center to discuss the triumph and uncertainty that the SDGs represent for the future of international development. They also highlighted specific disagreements on goals and targets around climate change, conflict, sexual and reproductive health and rights – and how less might mean more. The SDGs break from their predecessors in two key ways: their foundation in sustainability and their universality. While poverty alleviation remains at the center of development, “how we use and treat the earth has become an increasing part of that conversation,” said Population Action International’s A. Tianna Scozzaro. Climate change, population dynamics, and conflict are interrelated factors that are closely linked to development and wellbeing, she said. The Secretary General’s High-Level Panel on sustainable development, which includes leaders from government, civil society, and the private sector, highlighted the importance of addressing these issues in a universal framework – a set of goals that applies to every country and brings every sector of society to the table. The MDGs were drafted by OECD countries and include targets that are essentially only applicable to developing countries. But many of the issues on the sustainability agenda – limited access to family planning, economic inequality, and violence, among others – persist in OECD and middle-income countries as well. Given the scale, pervasiveness, and complex impacts of population, environment, and security issues, governments must not only agree to address them within their own borders, Scozzaro explained, but collaborate with each other and members of civil society and the private sector. The post-2015 agenda process is “very, very exciting because of its universality,” said Ilze Melngailis, UN Foundation senior director of global partnerships, but crafting a set of goals that applies to every country is easier said than done. “The most important issues are the most sensitive issues [and] the most politically tough issues,” explained Wael Hmaidan, director of Climate Action Network. Resistance to things like increasing access to voluntary family planning or cutting carbon emissions, remains deeply entrenched in some places, making it difficult for leaders of both developed and developing countries to sign on to important goals. At the same time, policymakers in New York struggled to condense the list of 17 goals and 169 targets and into a more manageable framework that could be conceptualized, acted on, and measured, explained Maricle. Focus itself, she said, was the one issue not on the table at the General Assembly, and without prioritizing, it may be difficult to effect meaningful change. Negotiators also remained bitterly divided over the mechanics of collaboration. They wrangled into the eleventh hour over responsibilities for various means of implementation – the technology, finance, and capacity building needed to accomplish the SDGs – said Scozzaro. They circled around whether implementation responsibilities should be spelled out under Goal 17 (on forging a new global development partnership), divided across goals, or left to national governments to sort out over time. Failing to pass an agenda that deals with key issues could significantly weaken future international development efforts, as well as faith in the UN system, said Maricle. The MDGs were one of the UN’s big ticket items. If we can’t do this well over the next year and a half, and the 15 years that follow, we will potentially be calling into question…what the UN is all about and what multilateralism is all about in the first place. For Maricle, the success of the SDGs hangs on the ability of leaders to make difficult decisions about what items should be addressed by governments and which should fall under the purview of the private sector or civil society. Negotiators must be able to trust that issues removed from the agenda will still be addressed, she said; they may just be a better fit for a different forum. There are more than 7 billion people on Earth and there will likely be 10-12 billion by the end of this century. Given the particular cultural sensitivities around family planning in many countries, the fact that universal access to sexual and reproductive health care was included under both the health and gender goals was a big success, said Scozzaro. She cautioned, however, that there’s still more work to be done. For the agenda to be truly progressive, sexual and reproductive rights need to be prioritized alongside care, she said, particularly for adolescent and LGBT communities. Scozzaro, who at Population Action International advocates for increased access to contraception for women and youth to improve their health, reduce poverty, and protect the environment, said that recognition of the links between population dynamics and other major issues on the agenda was also missing from the talks. Women are 14 times as vulnerable during climate-related natural disasters as men, thanks in large part to their role as caregivers and unequal access to educational and economic opportunities, Scozzaro said. The Climate Summit and International Conference on Population and Development occurred right after one another and in the same room, but the idea of increasing access to family planning as a means of building climate resilience wasn’t brought up. The fact that there is little crosstalk between these policy processes represents an enormous missed opportunity, she noted. Scozzaro, Melngailis, and Maricle underscored the importance of new and better data in demonstrating the myriad ways that sexual rights and the access to family planning shape education, poverty, health, and environmental outcomes around the world. They agreed that better information and modelling on how family planning can deliver results on issues countries care about would equip policymakers and leaders to take bolder action. Better data is particularly important in building the business case for investing in family planning, said Melngailis, who works to engage the private sector and build public-private partnerships with the UN Foundation. While corporations have mobilized resources to address “every issue under the sun,” family planning has never been a priority because its value hasn’t been clearly calculated and presented to them, she said. Given the private sector’s dynamism and ability to reach large audiences, it could play a pivotal role in expanding access in underserved areas. Climate change is another sticky issue that hasn’t necessarily been recognized by everyone as pertinent to the SDGs, said Hmaidan. While the framework so far includes a goal calling nations to “take urgent action to combat climate change and its impacts,” its larger treatment of climate change is not nearly as urgent as it needs to be, he said. Some have wondered whether, in light of the separate UN Framework Convention on Climate Change (UNFCCC) process, a standalone climate goal is even appropriate, and have instead advocated for integrating climate into other goals. Ideally, the handling of climate change in the SDGs would complement the work of the UNFCCC. Compared to the more constrained and entrenched UNFCCC process, the SDGs present an opportunity for strong, aspirational language on climate change that can inspire more robust action and build on the popular momentum of the recent climate marches, Hmaidan said. And it could be a way to rally support and attention around targets that are not a focus of the UNFCCC, including de-carbonization, low-carbon development, and national legislation and regulatory structures. There’s plenty of evidence that policymakers have done much of that heavy lifting, and are ready for more in the months ahead. At the outset of the drafting process there was concern that the effort to bridge sustainability and development would fall apart, but not only did several countries outside the open working group participate in the dialogues, Maricle said, but they did so in a substantive, analytical, and rigorous way. And despite the complexity of challenges on the table, it’s becoming increasingly clear that cooperation is the only way forward in a world growing more interconnected by the day. “Because of where we are with the internet and the media, because of the degree of scariness of what’s going on in the world around Ebola and the conflict in certain regions, clearly we are living in an era where we feel a shared sense of community around the world,” said Melngailis. Photo Credit: The opening session of a 2009 UN summit on climate change, courtesy of Eskinder Debebe/UN Photo. Sources: Scientific American, UN Population Division.